The Motiv-series Shure MV5 marries classic, vintage looks with modern features and outstanding sound at a great price, making it ideal for a.. The Motiv-series Shure MV5 marries classic, vintage looks with modern features and outstanding sound at a great price, making it ideal for any setup at home, from podcasting to video chats. Available in two colours (regionally dependent), MV5 can either make a bold statement or blend seamlessly into any creative space. An integrated headphone output offers real-time monitoring. The low-profile design and detachable desktop stand ensure flexibility and portability. The Shure MV5 is a highly adaptable microphone and is a great choice if you’d like to add more life to your podcasts and vlogs or simply want to add that extra crystal clarity to your voice chat sessions. If you’d like to record some live music, then the Shure Motiv MV5 has got you covered for that too! The MV5 makes recording as easy as 1-2-3 with its three preset recording modes; Voice, Instrument and Flat which adjust settings for gain, dynamics and equalisation to bring out the best from any source. MV5 also includes a Micro-B-to-USB cable for connection to a PC, Mac or Android device, and is available with a Micro-B-to-LTG cable for connection to Apple mobile devices. With the Motiv MV5, Shure have managed to fuse a beautifully vintage look with high standard, modern recording capabilities. The MOTIV series has the dedicated iOS ShurePlus MOTIV app. Just connect the MV5 to your compatible iOS device via the included Micro-B-to-LTG cable and you’ll be able to record at 24 bit / 48 kHz with manual adjustments to limiter, compressor and a five band EQ. 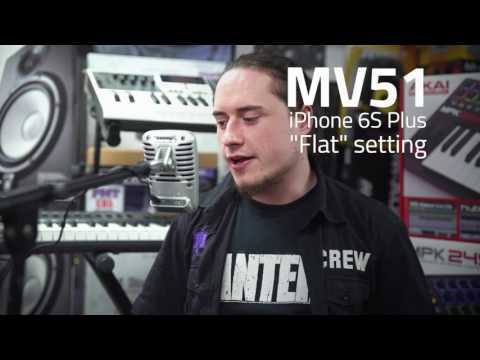 You can also use the MV5’s included Micro-B-to-USB cable to connect directly to your PC, Mac and Android devices to bring your retro looking condenser microphone into any aspect of modern recording. The Shure MV5 comes with its own sturdy, anodised aluminium stand giving it a nice and secure station for recording in your home studio but you can also mount the MV5 onto any standard 6.35mm camera tripod making it perfect for recording on-location too! Via the integrated audio output you can even connect your headphones to the MV5 for real-time audio monitoring in the field.